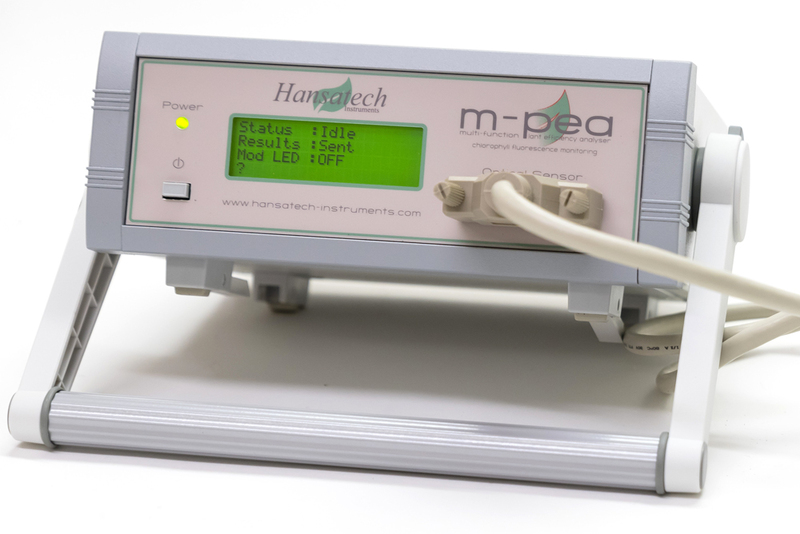 The M-PEA (Multi-Function Plant Efficiency Analyser) combines high-quality fast fluorescence kinetic and P700+ absorbance studies with ground-breaking delayed fluorescence (DF) measurements providing one of the most comprehensive systems for the investigation of plant photosynthetic efficiency available. 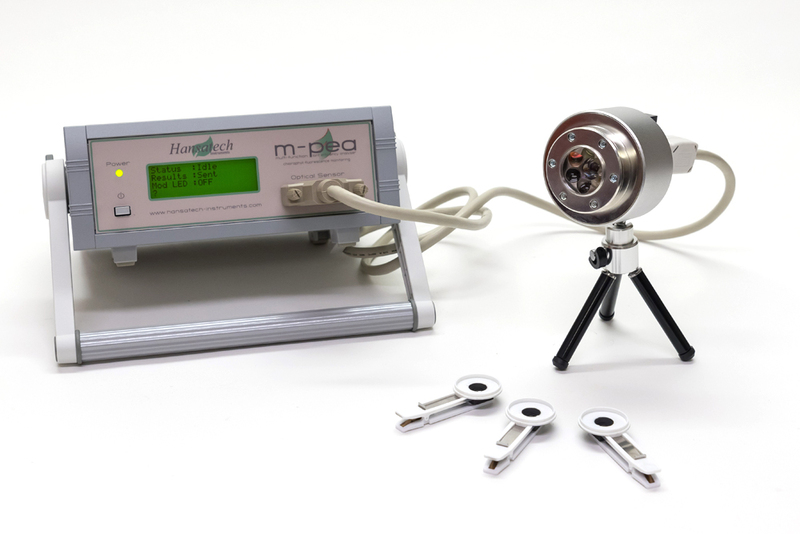 The M-PEA is a laboratory-based measurement system consisting of a control unit and sophisticated, robust sensor unit housing all optical emitters and detectors for all measurement elements. 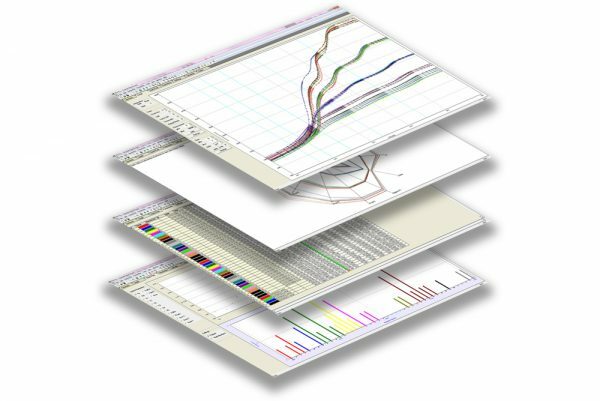 The system is controlled from a comprehensive Windows® software package (M-PEA) which allows complex experiments to be designed, uploaded and executed by the M-PEA hardware. Recorded data is quickly downloaded to the software via a USB 2.0 connection. The control unit is of convenient size with minimal footprint allowing measurements to be made in a busy lab environment where bench space is critical. The front panel consists of a power switch and indicator LED, optical sensor connection and a 4-line LCD display. The rear panel provides input for a 12V DC power supply and a USB 2.0 connection socket for interface to the M-PEA software running on a Windows® PC. The optical sensor unit is a robust enclosure designed to incorporate sophisticated electronics which effectively controls all of the light sources and detectors. The M-PEA-1 sensor unit includes a high-intensity red actinic source, a far-red light source, the prompt fluorescence detector and the modulated emitter/detector pair for P700+ absorbance measurements. 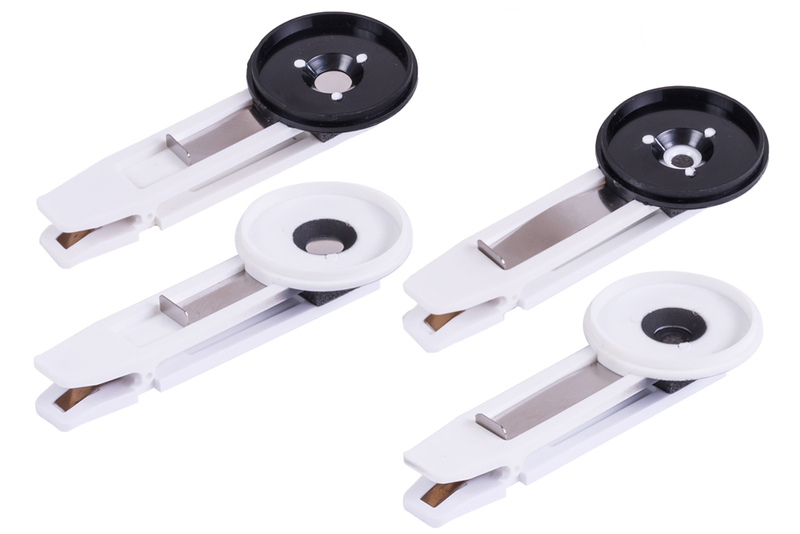 M-PEA-2 additionally includes a high-sensitivity delayed fluorescence detector and a detector to measure leaf absorptivity. 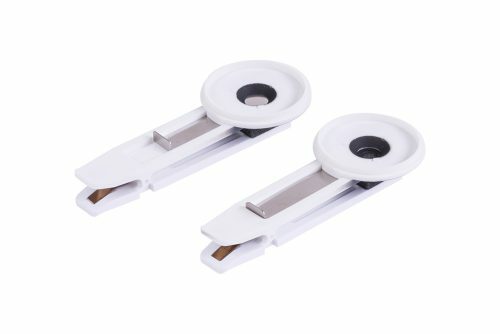 All the optics are located behind a quartz window which seals the sensor unit providing effective protection for the optical assemblies against dust, dirt and moisture. The photosynthetic electron transport chain consists of 3 large protein complexes Photosystem II (PSII), Cytochrome (cyt b6/f), Photosystem I (PSI). P700 is the term used to describe the chlorophyll within the reaction center of PSI as this is the wavelength of light to which the photosystem is most reactive. Upon illumination using a strong light source, the photosynthetic electron transport chain is almost entirely reduced. The electrons from this reduction, in turn, activate the enzyme ferredoxin-NADP+ reductase which leads eventually to NADP reduction and CO2 fixation. This initial reduction process is represented by the OJIP steps of the Kautsky induction curve during prompt fluorescence measurements. The oxidation of P700 causes an increase in absorbance at wavelengths falling in the 800nm – 850nm band. M-PEA measures the transmission of P700 using a modulated LED with a peak wavelength of 820nm and a highly sensitive photodiode to monitor the absorbance of the PSI complex during prompt fluorescence measurements. Since the 820nm LED is not actinic, M-PEA is able to use high light intensities without disturbing the PSII complex. 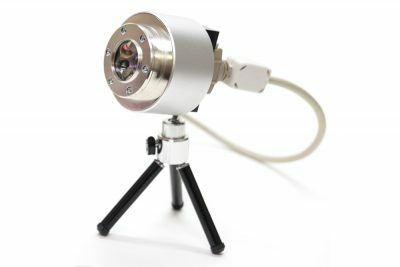 Therefore, M-PEA presents a convenient, reliable method of measuring chlorophyll a fluorescence and transmission at 820nm simultaneously, thus allowing the study of the electron transport process during the Kautsky induction at both ends of the photosynthetic electron transport system. M-PEA is also fitted with a far-red light source which can be used to preferentially excite the PSI complex. Re-reduction occurs via the intersystem electron transport chain by PSII activity, with electrons originating from hydrolysis. The M-PEA uses an optically filtered, modulated 820nm LED for high-quality P700 absorbance measurements. 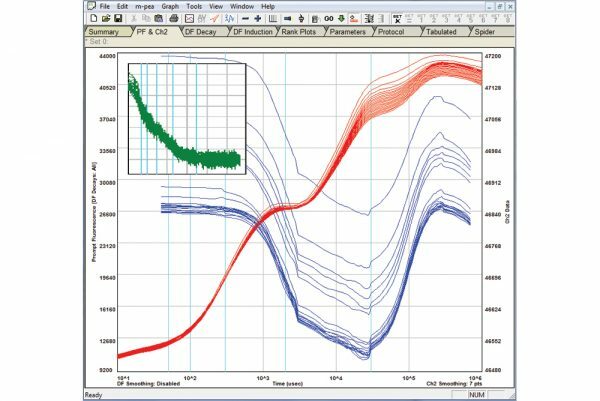 P700 activity is recorded using an optimised low-noise, fast-response PIN photodiode and 16-bit A/D converter providing an excellent signal-to-noise ratio. Delayed fluorescence (DF) has much in common with prompt fluorescence (PF) because it originates from the same chlorophyll molecules of the Photosystem II antenna complexes. DF is essentially light that is emitted from green plants, algae and photosynthesising bacteria for a short time after they have been exposed to light, but after the prompt fluorescence emission has decayed. Delayed fluorescence occurs in the red/infrared region of the spectrum (the same as prompt chlorophyll fluorescence). 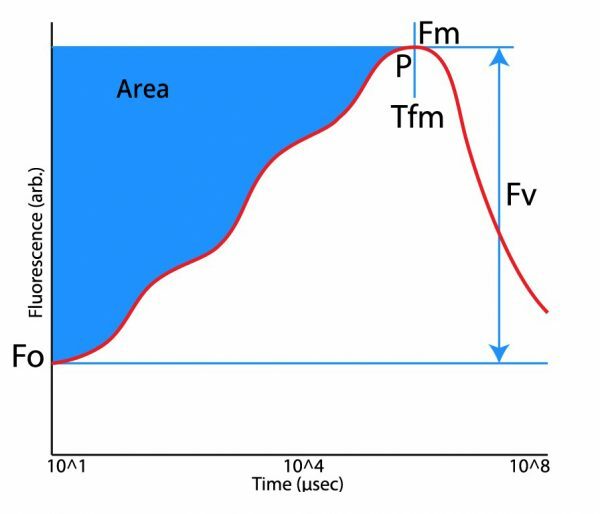 However, the intensity of the delayed fluorescence emission is lower than that of prompt fluorescence by at least two orders of magnitude therefore requiring highly sensitive apparatus to measure the signal. Like PF, the properties of the DF emission are highly sensitive to the functional state of Photosystem II and the photosynthetic reaction chain as a whole. Theoretically, DF bears even more information about the photosynthetic processes than PF. 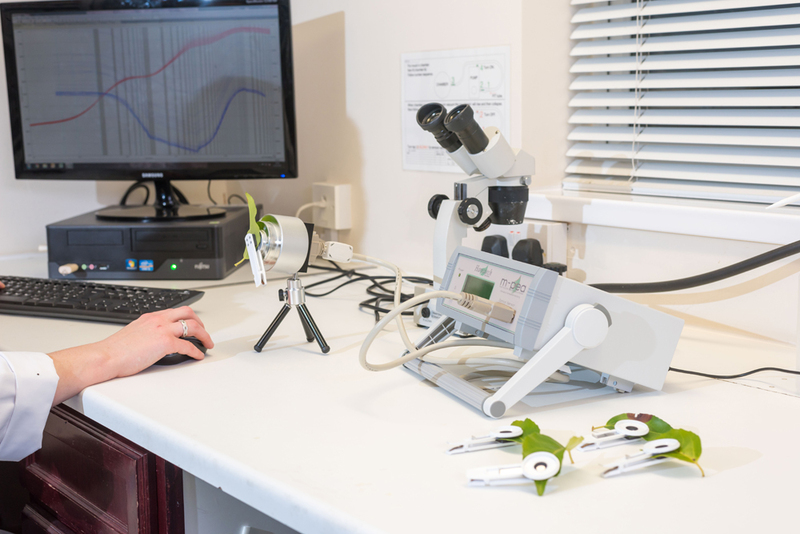 Still, a fluorescence measuring instrument can be found in almost every plant science research laboratory, while DF has not gained much popularity as a practical method to study photosynthetic organisms. One reason for such injustice is that DF is harder to register than PF. But the greatest difficulty in using DF is its interpretation, or extracting the valuable information from this extremely complex signal. Fortunately, in recent years we’ve witnessed major advances both in development of electronic engineering and also in the theory of DF measurements. We are more and more able to utilise DF for practical scientific research. It is the combination of these 2 factors that has lead to the development of M-PEA. The delayed fluorescence emission, natural to all green plants, has been known to scientists for over fifty years. It was first discovered by Strehler and Arnold (1951) when they were attempting to use firefly luminescence for the measurement of the light-induced accumulation of ATP in the green alga Chlorella. They found that even without the addition of luciferase and luciferin, there was a long-lived glow from algal cells and chloroplasts in darkness following illumination. The observed delayed fluorescence was characteristic of different photosynthesising samples used—leaves (Strehler and Arnold 1951), chloroplasts and photosynthesising bacteria (Arnold and Thompson 1956). Strehler and Arnold postulated that it was in fact chemiluminescence of the chlorophyll, caused by reversal of the photosynthetic reactions. The close relationship between DF and the photosynthetic reactions was confirmed undoubtedly in many studies and sometimes DF was found even more sensitive than the prompt fluorescence (Kramer and Crofts, 1996). The protocol editor allows the creation of experiments for deployment on the M-PEA system. Experiments can range in complexity from a simple 1 – second prompt fluorescence measurement through to repeating, multi-flash measurements using prompt and delayed fluorescence, P700+ and relative absorptivity to probe the activity of PSI and PSII complexes within the photosynthetic apparatus. Several different data presentation techniques have been combined in order to effectively demonstrate subtle differences in the fluorescence signature of samples. 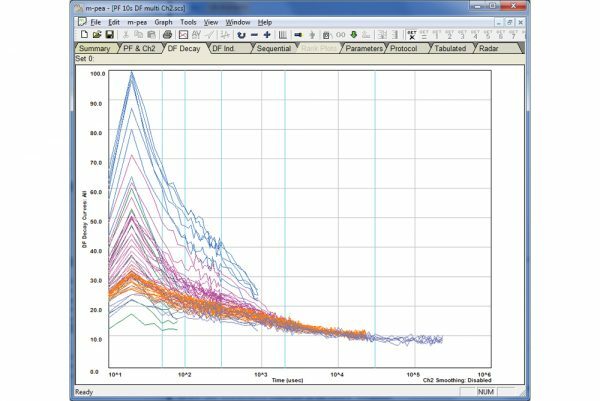 Data may be presented in graphical, tabulated or radial plots which can all be tailored to display any number of the 58 prompt fluorescence parameters measured by M-PEA. Transferred data may be exported to CSV format for further statistical analysis in external software packages. M-PEA+ will run on all supported Microsoft® operating systems. USB Drive containing M-PEA+ software and manuals. Max intensity 5,000 μmol m-2 s-1. P700: Low-noise, fast-response PIN photodiode with an optical bandpass filter. Use the tool below to enter search terms as required. As an example, hansatech instruments M-PEA has already been entered into the search box. Press the "Search" button to view the Google Scholar results for this search string.